Our research team has reviewed the limited information provided by after the most recent inspection of unit 2. While the data was unacceptably limited it does provide a few clues about the conditions within the reactor and the events of the meltdown. The photo for “fallen grating 1” shows what appears to be solidified fuel debris. The imagery shows a fairly solid material with a brown hue coating a section of remaining grating. The other two locations in the diagram above show a section of a metal equipment rail flagged as the cable tray that sits roughly 2 feet off the floor. 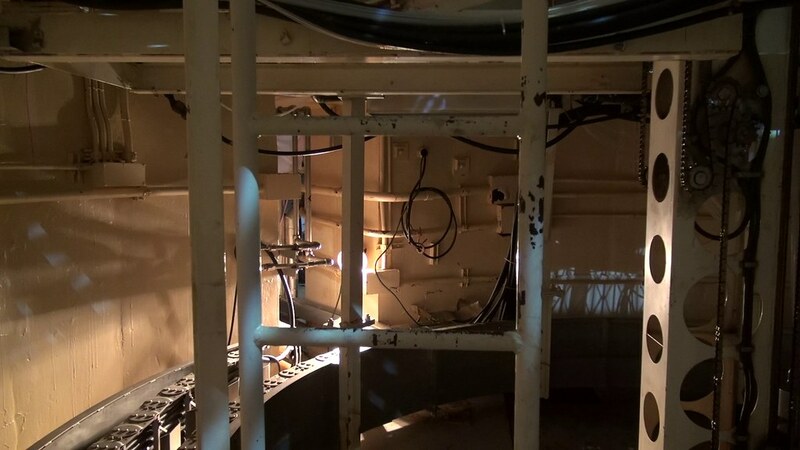 The photo below from unit 5 shows the rail on the left side of the image. This area in the photos shows small gaps between the rail sections and two cable tray runs. 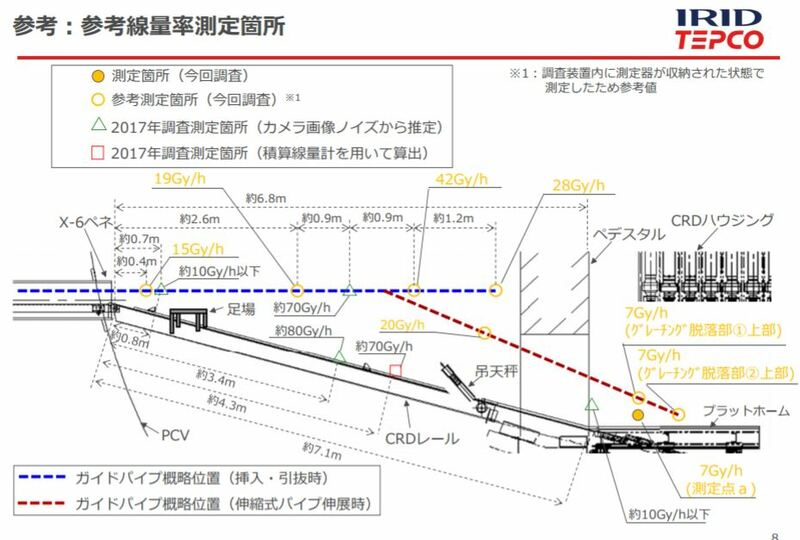 The illustrated diagram from TEPCO appears to show a uniform flat surface above this area. It is not clear if unit 2 has some form of cover that unit 5 does not. If unit 5 has a cover for this area but it is removed in the photo or if neither have an actual cover over this area. A cover or lack of cover changes how the findings could be interpreted. 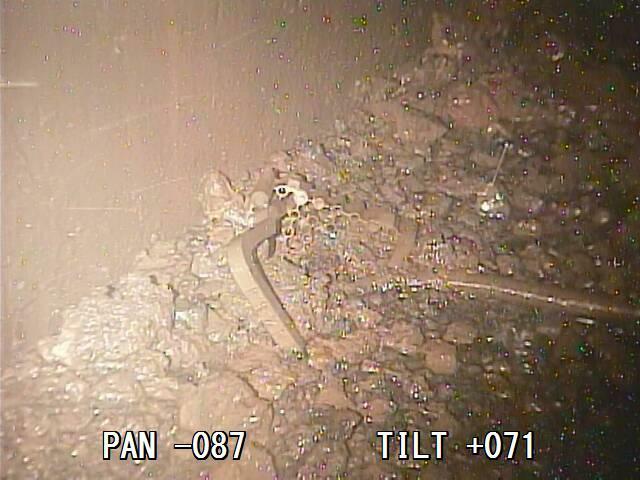 Below are the two photos provided by TEPCO labeled as being on top of this cable tray. The photo above of the cable tray shows an un-melted fuel assembly lifting handle and a tie plate. Both are steel pieces from the top of a fuel assembly. These pieces sit above and slightly integrated into the debris pile. 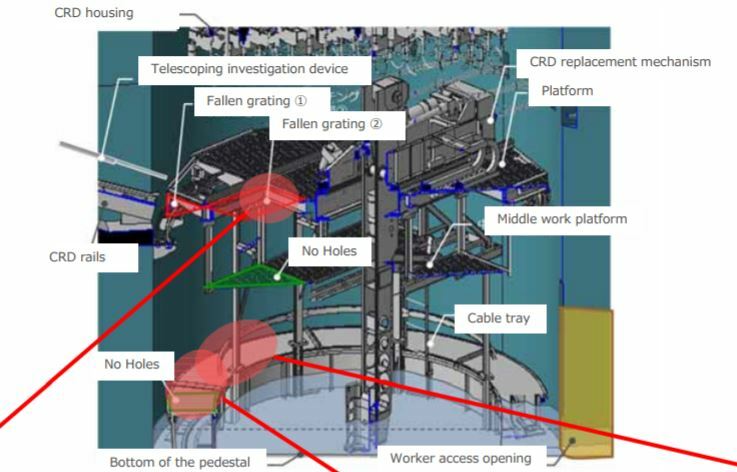 A similar situation was found inside unit 3 where un-melted reactor parts were found in the containment pedestal among the fuel debris. This finding gives a few hints and raises some major questions. The debris that appears to be in a pelleted form is more black than other fuel debris. It is also not a uniform material such as that found around the grate that surrounded the melt through holes. This debris is also found on an elevated area indicating it likely deposited there from above. This would mean it came from a failure on the outer circumference of the reactor vessel, not the center. This area recorded at about 7-8 Sieverts/hour. Significantly higher radiation readings were found on this inspection in areas outside the pedestal. 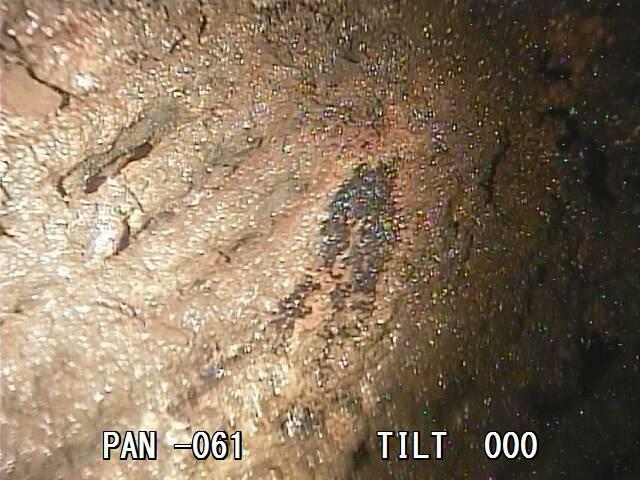 This fuel debris is not covered by water so these radiation levels are lower than expected for fuel debris. This along with the shape, color and location of the materials may indicate that they have a high content of metals and a low content of actual melted nuclear fuel. These materials probably cooled quickly as they didn’t collapse or burn through the rail or rail cover. The fuel assembly handle and separator also did not fully melt into the fuel debris pile. Either the pile did not sustain decay heat due to the lack of fuel in the mass or the fuel assembly parts fell later on after the pile had cooled substantially. Additional information about the stratification of melted nuclear fuel and the metal reactor components shows that this pile of debris may have been mostly metals from the reactor. This 2004 paper by Salay & Fichot details the behaviors of corium (melted nuclear fuel) in the bottom head of a reactor vessel. It shows that the heavier materials in the fuel pellets will separate and sink lower in the melted materials as they collect in the bottom head of the reactor. The metals will sit on the top of the melted materials. 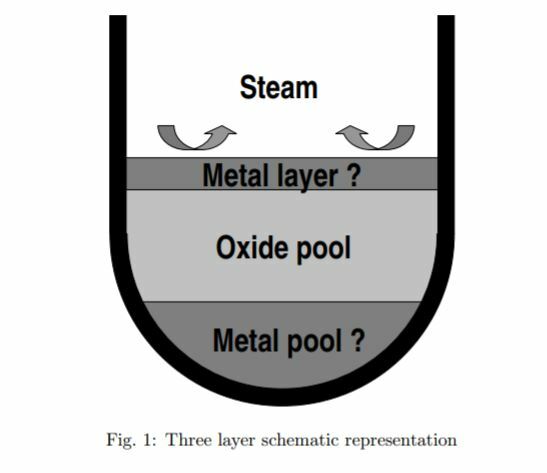 As the melt stratifies and the bottom head begins to fail, the oxide layer may fall through the failure holes in the center of the reactor vessel with the top metal layer falling through a side failure. Various other studies over the years have documented the potential for “creep rupture” this is where the heat of the corium (molten fuel debris) begins to heat then fail the outer section of the curved bottom head. 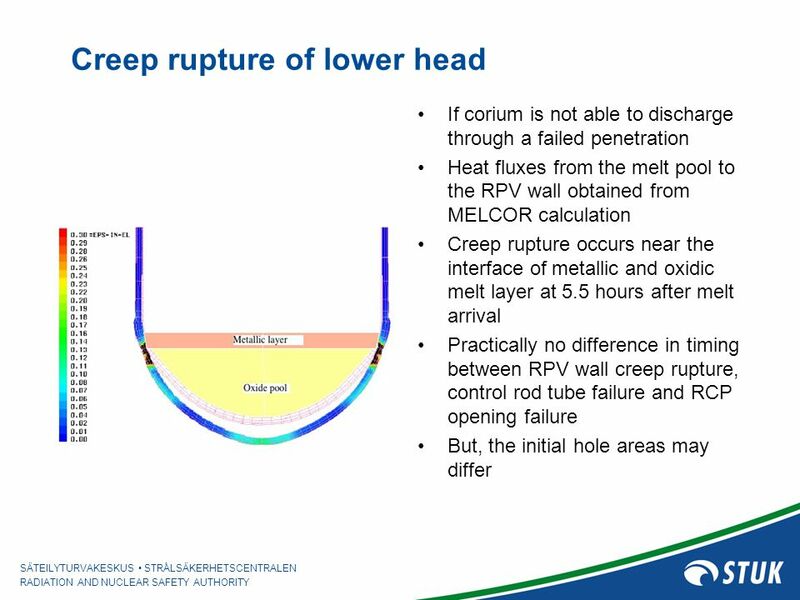 The above illustration from a Finnish nuclear safety presentation on potential bottom head failure of a nuclear reactor vessel illustrates how such a failure can happen. It could leave the metal oxide layer as the material that will leak out through the side creep rupture failures. 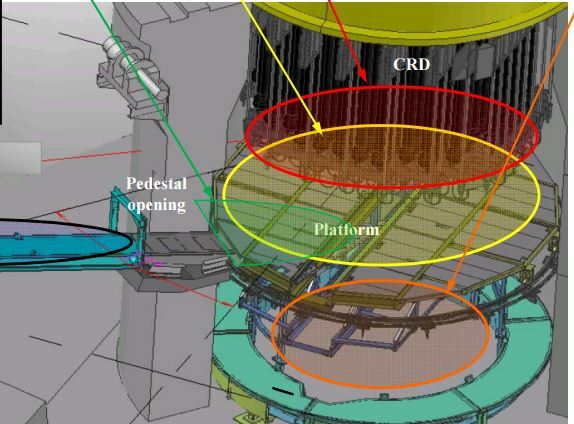 The phenomenon explains that this can happen while the central control rod penetration holes also fail and create a path for molten fuel to fall into the pedestal. This closely tracks what is being seen inside unit 2 based on the limited information. That the fuel that fell though the central failure holes of the reactor vessel was the molten layer that contained most of the actual melted nuclear fuel. The peripheral creep rupture failures allowed the mostly metallic layer to fall into the outer areas of the pedestal. A similar behavior may be in play inside unit 3. Similar un-melted fuel assembly and control rod parts were found in the fuel debris piles in the outer peripheral area of the pedestal in unit 3. 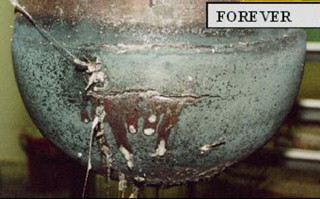 The above photo shows what a creep rupture in the bottom head of the reactor vessel could look like. The image is from a research model for nuclear reactor bottom head failures. A very limited number of radiation and temperature readings were provided by TEPCO in the recently published Roadmap documents, made public on February 1, 2018. These provide some insight into the conditions but are not a replacement for the needed full disclosure of the inspection. Readings in the above slide include older readings and new readings. those marked with a green triangle or a red box are 2017 readings from the robot inspections. Yellow flagged readings are the 2018 readings. The 2017 rail readings are higher than the new readings. This indicates that there may be a source of radiation closer to the rail or below it. The lowest of all these readings are inside the pedestal including near the fuel debris documented along the peripheral area of the pedestal. Temperatures and radiation readings along the probe route show consistently low radiation levels and no fluctuation in temperature. The radius of the pedestal is 3 meters. If there was any significant amount of nuclear fuel containing debris in the center of the pedestal the radiation levels would have been much higher. 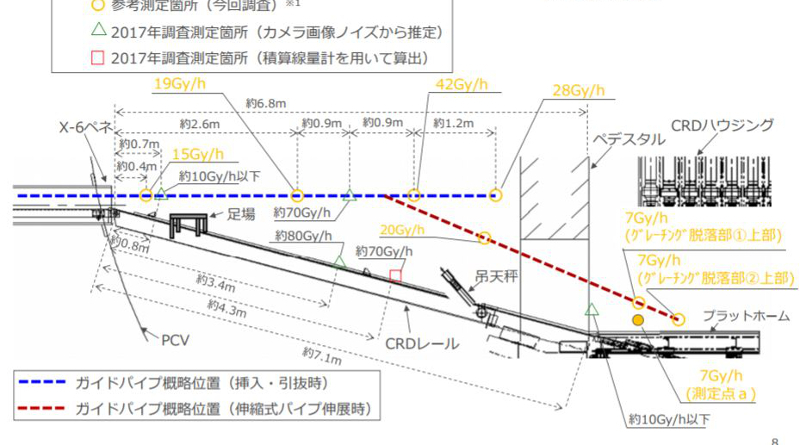 TEPCO’s claim that they found fuel debris may only be partially true. They found some fuel debris but what they found as documented so far didn’t contain considerable amounts of nuclear fuel pellets in the melted debris. 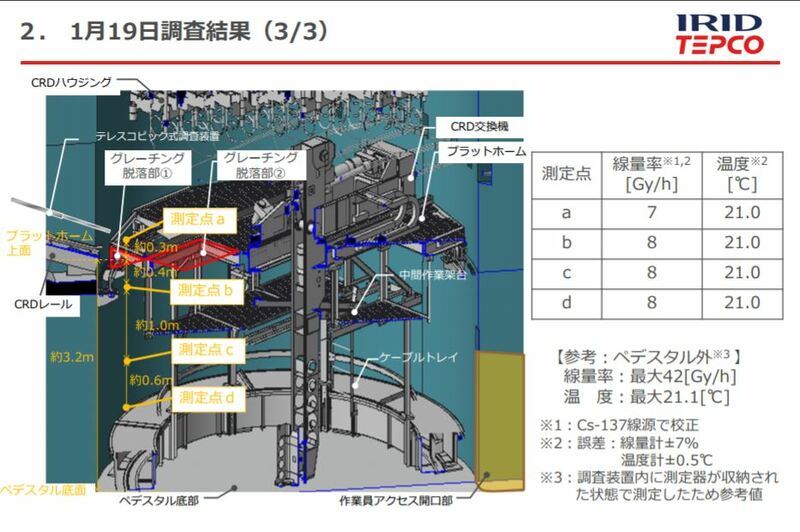 This raises new questions about TEPCO’s refusal to release all of the footage and still images from this work including the central pedestal floor area.